Does the piece you’re performing at the Walker show any influence from or reflection of your home country, and if so, how? Every piece that I make, I am sure there is some influence from where I am from, but I don’t consciously think about it. It’s more about where I am at in my life, what is happening around me. I thought about aging and time for this piece. My puppet, Tony, was created thinking of fat skinny old baby. I felt my niece’s growth and my father, getting old are quite similar. One life is blooming and the other is kind of ending, but when I look at a point of their lives they are at the very similar stage. I wanted the puppet to have both old and young quality and I knew the puppet can do that. He can carry past, present and future at the same time. For this particular piece, I was influenced by Dan Hurlin a lot because he is the one who introduced me to puppetry. 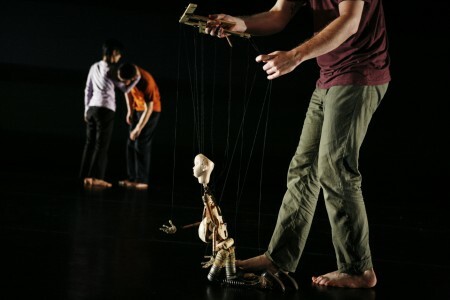 I just found that a puppet is a great performer and he will highlight every one of us on the stage as well as himself. Why did you make the move to New York City? I came to NY from Matsuyama, Japan because I went to NYU for my Masters’ degreee. My teacher in Japan also encouraged me to go NY. I never intended to move here, I always thought I was here temporarily, but somehow, ended up being here. I am in NY for the last 19 years. What does New York offer you as a professional dancer/choreographer that you can’t get elsewhere? While some people think that New York’s preeminence as a dance capital is waning, do you find that it’s still a place for risk-taking and experimentation? Really good collaborators, like my artistic team. I am risk-taking and experimental as an artist. I am sure seeing how other people are taking a risk (from seeing people’s works or talking with my friends) makes me encouraged to go on my way. Maybe that’s part of living NY. Living here and creating works often really pushes people to the edge emotionally, physically, financially, psychologically … I am in it, so usually I am not so aware of it, but when I come back to NY from other places, I can feel that energy. How much (if any) touring have you done with the piece you’ll be performing at the Walker, and how was it received by audiences outside New York? We went to Ukraine. It was quite interesting. The way they looked at the show is so different from here. They talked and made comments while they were watching. There were very interesting questions after the show and everyone was very into it. I think it was received really well. It very much does so for me even though if you ask someone from my home country (Uruguay) they might not see it very clearly. It definitely does not use any kind of folkloric form or any specific cultural reference to the southern cone of South America. However, it does have a very specific kind of sensibility that could be perhaps compared to Latin-American literature and/or Spanish cinema (a la Almodóvar) because of its embracing of emotion and drama in an exaggerated and verging on the absurd way that is both a celebration and a mocking of itself. Most importantly, though, this piece is influenced by the history of where I come from. It reflects the infatuation I’ve had with the political and social idealism of my parents’ generation in Latin America, when and where they were actively working and fighting to create change. Growing up in Latin America with the awareness of always being under the United States’ Government’s big boot made me extremely aware of the power structures present in every different aspect of our society and relationships in general. In this work I am both celebrating those ideas and exposing their naiveté, and I am exploring the power play inherent within the theater, in terms of the gaze of the audience and how it is not unlike women’s role and the male gaze. You’ve studied, lived, and performed in California (and elsewhere?) – why did you make the move to NYC? I also studied, lived and performed in Montevideo, Uruguay. I moved to NYC because I was interested in continuing to study with certain teachers that had come through CalArts (California Institute of the Arts) as guest artists and who had influenced me greatly and made a really lasting impression. Also, because I was fascinated by the Judson era so it seemed like I had to go there to learn more about it from the people that had been there then and were still teaching and making work there. What does NY offer you as a professional dancer/choreographer that you can’t get elsewhere? While some people think that NY’s preeminence as a dance capital is waning, do you find that it’s still a place for risk-taking and experimentation? I have been in NY for my whole career after I graduated from College so I can’t say with total knowledge what you can or cannot get elsewhere. However, I believe that the amount of work that is made here and the diversity is so great that it is a great place to become more and more specific about what your own specific aesthetic is and to become more rigorous about your own ideas. The standard seems to be set very high because there are so many choreographers making work here and so many amazing dancers. It is practically impossible to become complacent and lazy about what you’re putting out there. Also, because it is so expensive to live in NY and because of the level of competition, it takes a lot of commitment and passion to continue on making the work and that feels sometimes like it must give it a certain edge and rigor that seems particular to work from NY. I do believe still believe that there is a lot of experimentation going on in NY even though a lot of it is happening in more unknown venues, more underground. However, I definitely do not think that NY is the dance capital. I think we have moved away from the model of centers of culture being the places where anything interesting is happening and the peripheries being nowhere lands. That is a really old model that does not apply to how the world is now. I am still in NY because I have created very special bonds within the dance community here and I have become who I am as an artist through the work I have done collaborating with different artists here. In some ways I feel like I am a local artist that happens to be in NY. Also, being a foreigner in NY allows you to feel like you are as much a part of the making of the city as anyone else and you don’t feel so much like an alien. How much (if any) touring have you done with the piece you’ll be performing at the Walker, and how was it received by audiences outside of NY? Unfortunately, I did not do any touring with this piece until now. We were invited to perform it in a Dance Festival in Uruguay but the funding didn’t go through because it was coming from the US Embassy there and when they saw a sample of the work they denied their support since it seemed to them like it was a criticism of the War in Iraq and they were not willing to fund that. You’ve studied, lived, and performed in California (and elsewhere?) – why did you make the move to New York City? new york is the world cultural center. I am at home in nyc as i am in dakar. What does New York offer you as a professional dancer/choreographer that you can’t get elsewhere? While some people think that New York’s preeminence as a dance capital is waning, do you find that it’s still a place for risk-taking and experimentation? I would get the cultural stimulation in other cities in the usa. In NYC, africa in is the streets, i hear it see it, This access to all people is what keeps NYC on the cutting edge compared to other American cities. A knowing/ theater going audience … another reason to show work in the city. There is an audience for it. A great many cities in the USA, Canada, Senegal, Tanzania and Kenya. 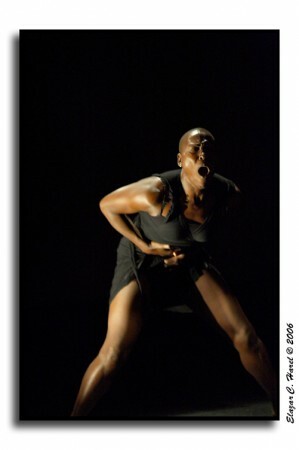 I received a touring support suport from the National Dance Project to tour the USA. This piece was also been awarded a BESSIE for its NYC showing. The work has been well received, but it has challenged audiences who have superficial knowledge of Zimbabwe, it has also challenged Africans in Africa, who too have “working knowledge” of Zimbabwe’s history, never mind a female contemporary dancer!! !